Hello world, This post is for all the serious foodies out there! 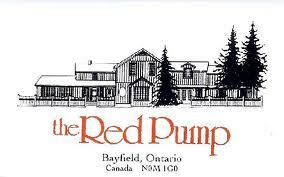 As of today, the Red Pump on Main street in Bayfield, has officially opened for the season!!!! The Red Pump is one of my absolute favourite restaurants of all time! OK before I get too excited and start talking about the food I will focus on the hours of operation. Tonight they are open for dinner and for the rest of the week they will be open for lunch and dinner. The Pump will close down Monday and Tuesday and the open again Wednesday lunch and dinner right through until Sunday. Those hours will continue every week until sometime in June as far as I know. All right, back to the fun stuff, let me just start telling you about the Red Pump. The food is honestly amazing! This is more of a fine dining place; however the money you spend is worth every single penny! It is not one of those fancy restaurants where you leave still feeling hungry, believe me you will be satisfied after your meal! Another great thing about the pump is the lunch menu. It is perfect and actually fairly inexpensive! AAAANNND if you are a fan of wine, like myself, they have so many amazing wines to choose from! I highly recommend people check out the Red Pump, I have never once had anything but amazing meals and experiences there! I will be at the Pump tomorrow night trying out the new menu! I will post pics and let you know how delicious everything was!